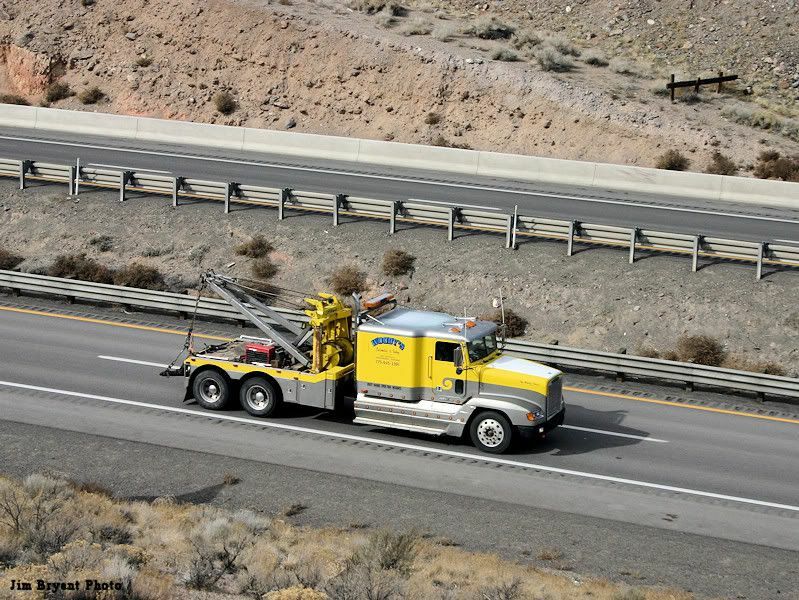 Caught this nice Freightliner tow truck out at McCarren, NV almost at the Patrick Exit on I-80. Thought this would fit nicely into the vocational truck thread. The outfit is call Woody's Autobody and Towing and the truck is out of Hawthorn, NV on US 95. Yes, I thought it looked very nice and well kept. the distance that one might have to have a tow out of the Hawthorne area for major repairs is probably a good reason the truck has a sleeper bunk - - nice shot. I really don't remember them but I rmember there was a place that washed trucks on the north side of town as the inspector at the depot wouldn't let us load if there was any grease or oil showing on the truck. I think he must have got a commssion from the wash guy as it was alfully hard to get past him without getting a wash job. I could understand it if loading flamables or explosives but we usually only loaded empty ammo boxes or canisters. Ringsby almost always had trucks on the base either delivering or loading. They were in that part of town by that wash place you mention on the east side of the road.